Take a bowl. Add rava, rice flour, maida, water and mix it well. Keep it aside for 15 minutes. Meanwhile, chop all the other ingredients and add it to the batter and mix it well. If it is too thick then add more water. Take non stick tawa and put 2-3 drops of oil. 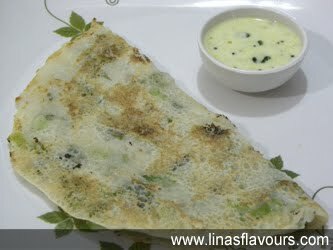 Pour about 2 ladleful of batter and spread it evenly to make round dosa, starting from the edges to the centre of tawa. Cook on both the sides till light brown and serve it immediately with your choice of chutney.